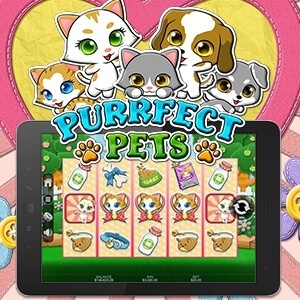 Get ready to cuddle up with some of the cutest animals imaginable and enjoy a great range of bonus prizes with our new online slot game, Purrfect Pets, from RealTime Gaming! 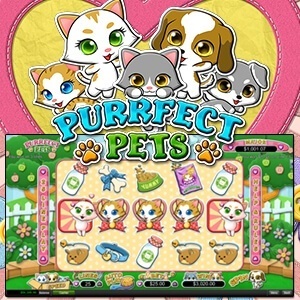 This 5 reel, 25 variable payline, progressive jackpot online slot game is brimming with all of the adorable features of the cats and dogs we love and cherish! Keep a lookout for the Cats Wild as they award 10 free games during which the Wilds triple your prizes! Retrigger this feature time and time again, as long as you spin 1 or more Cats Wilds during the feature. 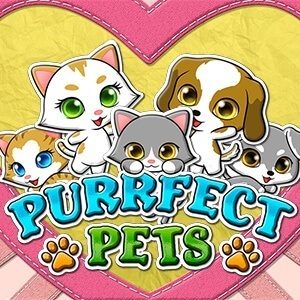 And keep an eye on the scattered Dogs, which will act like Wild Cats and double your prizes. There is also a Random Riches feature, which awards up to 50 free games when triggered. Random Riches doubles all prizes, and gives out up to 6x for winning combinations! 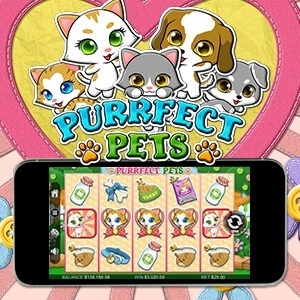 This online slot is available on Download, Instant Play and Mobile, so get ready to play with the Purrfect Pets today!